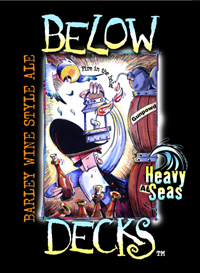 Pours a medium amber color with a beautiful frothy off-white head with excellent retention. Body is clear with very still activity. Aroma is heavy with alcohol and slight maltiness and a bit of charcoal. Initial taste is full of carbonation with a load of heavy sweetness, and the alcohol notes invade the finish with a deep burn at the back of the throat. With a medium body, it coats with an oily texture that leaves us dry with soft carbonation.